However, there were some Hungarian experiments to up-arm the Ansaldo to make it capable of dealing with enemy armoured fighting vehicles. 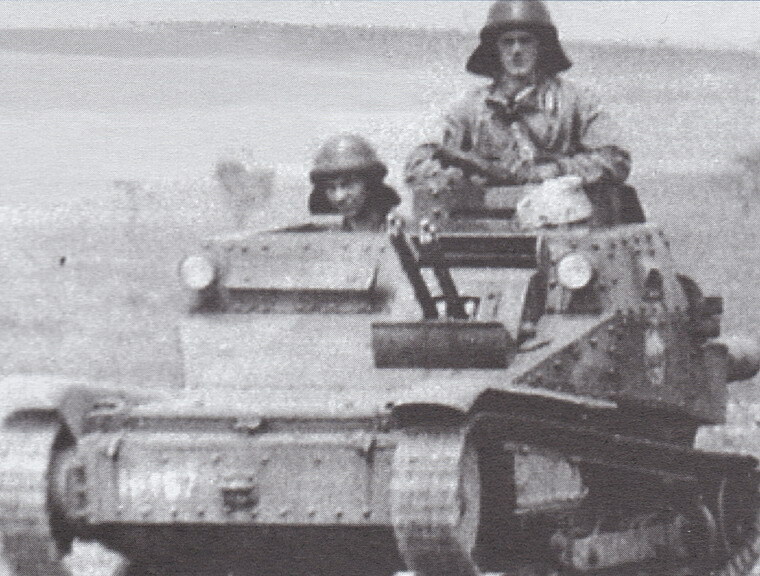 In 1936, soon after the first Ansaldos arrived from Italy, the Hungarian troops suggested to create a turreted version of it to increase its very limited view range and it’s self-defence capability. The Ministry of Defence ordered a prototype, which would be able to mount a (yet unfinished) 12,7mm heavy machine gun and a single 8mm machine gun in a turret. The 8mm machine gun was a little problematic because of its relatively large magazine, as the turret would have been 12cm higher than without it. This issue was solved with a tiny cupola on the top of the turret just for the magazine. But the 12,7mm machine gun was not yet available at that time – it was still under construction – so the prototype vehicle was armed only with the original dual 8mm machine gun. - Thanks to the additional approx. 160kg weight of the turret, maximum speed on roads was decreased by 10%, uphill by 50%. This meant the maximum road speed on roads from 42 km/h to 38 km/h. - The turret was small and cramped, which made operating the armament a bit difficult. - The center of gravity moved higher and a little bit to the left, so the lateral stability was reduced. - The turret was mounted on the left side of the vehicle, so the load on left track was increased, which made the lifespan of the left roadwheels, chains, brakes, etc. much shorter. - The traverse speed of the turret was worse than the traverse speed of the hull of the original 35M. Ansaldo. - The only turret door was on its top, which made the emergency entry or exit too slow. After the failed trials, the development was halted and the whole idea was scrapped. In 1937, the Ministry of Defence ordered the batch series (90 pieces) of the “tiltable-turret” machine gun mounts for the soon arriving Ansaldos. This second batch was designed to be able to replace the left 8mm machine gun with a 12,7mm heavy machine gun if necessary. A prototype vehicle with this modified “tiltable-turret” was finished in August 1937 and it was presented as “Ansaldo II” for the military leaders. However, the 12,7mm heavy machine gun was still not mass produced and because the Ansaldos couldn’t just wait for it, they were armed with the original dual 8mm machine gun. Later, in 1940, when the 12,7mm heavy machine gun was ready, the production of the Toldi light tanks and Nimród self-propelled autocannons was already started, so the planned anti-vehicle armament for the Ansaldo was no longer needed. In 1940, another suggestion appeared to arm the obsolete Ansaldos with an anti-tank or field cannon, like the Italians did with their L3s. The suggested gun was the 37 M. 40mm tank gun, which was originally designed for the Straussler V-4, 110 barrels were already even manufactured for it. Later, these guns were used in the conversion of the Toldi IIs to Toldi IIAs. However, the Hungarian Institute of Military Science (HTI) noted that such up-arming would be only possible, if the obsolete and worn-out suspensions of the 35M. Ansaldos would be repaired and/or modernized. Such process would have been definitely not too economical, so the plan was abandoned even before the experimental stage. As I said earlier, in WoT terms, the serial 35M. Ansaldo is a no go, it’s just too weak – useless armour (13/8/6 mm), okay top speed (42 km/h) with mediocre mobility (13,4 hp/ton), useless gun – and it wasn’t designed to deal with enemy tanks anyway. Additionally, it didn’t have a rotating turret, which would be crucial for a tier 1 tank. But maybe some of these Hungarian experiments might be acceptable for WoT. First of all, the gun: Unfortunately I didn’t find anything about the armour penetration values of the above mentioned 12,7mm heavy machine gun. All I know about it is that it was definitely the 40 M. Gebauer GMK 12,7mm heavy machine gun, (even though it’s not exactly defined in my main sources) because that was the only 12,7mm machine gun developed in Hungary at that time. It was a fully automatic motor-machine gun, which was originally developed for the Italian airplanes of the Hungarian Air Force on the basis of the 26/31 M. 7,92mm Gebauer machine gun. It was practically the same gun in higher caliber. A single 40 M. Gebauer GMK weighed 20 kg, its muzzle velocity was 800 m/s, and if we look at the 1100-1200 round/min rate of fire of the motor-driven 7,92mm Gebauer, it seems likely that the 12,7mm version also had very high rate of fire (sadly, no exact data). However, it doesn’t necessarily mean that the 12,7mm Gebauer would be enough for the Ansaldo, because the closest in-game weapon to it is used by the T7 Combat Car, the American tier 2 premium light tank, the ‘Browning MG caliber .50 HB, M2′ machine gun (also the stock gun of the M2 Light). 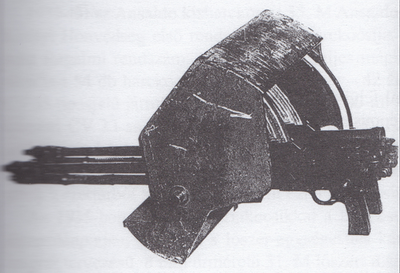 Its real caliber was also 12,7mm, but it had higher muzzle velocity than the Gebauer, around 870 m/s. According to WoT wiki, that tier 1 machine gun is the weakest armament in the whole game. In the game, the 12,7mm Gebauer would have even less penetration than the Browning .50 cal, – so less than 27mm in game terms – with significantly higher RoF. Because the ‘Ansaldo II’ didn’t have a fully rotating turret, it can’t be a tier 1 tank. However, it also didn’t have good armor or as good mobility as the in-game T7 CC, so I say it’s not an adequate candidate for a tier 2 turretless light tank either. Therefore, in my opinion, the ‘Ansaldo II’ with the 12,7mm machine gun is still too weak for WoT, and it won’t be implemented. The 35M. Ansaldo experiment with the turret is another matter, it might become an acceptable tier 1 candidate, but I have to say, that the 12,7mm machine gun as the top armament is still questionable, especially if compared to the already in-game tier 1 tank’s guns. The other thing is, as you can see, the turreted Ansaldo was a pretty bad design for a tank. It might need some serious, unhistorical buff to its soft stats from WG to became a usable tier 1 vehicle. In my opinion, the turreted prototype of the Straussler V-3 tank would be a better choice for that role. In turn, the Ansaldo with the 40mm gun might be a good idea for a tier 2 premium TD. That vehicle would be something similiar to the French tier 3 TD, the UE 57 a tier lower, because the chassis of the UE and the Ansaldo were very similar. But TD version of the Ansaldo was just a pre-plan, a suggestion, so there aren’t any blueprints available for it. Wargaming would have to design this vehicle by itself. Lastly, I’m sorry that I didn’t provide pictures for these vehicles, but there aren’t any of them in the “easily accessible sources”, such as books or magazine articles. There might be some photos or blueprints lying around in the Hungarian archives, but looks like none of them were published yet. - Ansaldo with turret: maybe not the best, but a possible choice for the Hungarian tier 1 light tank. - Ansaldo with the 40mm tank gun: a possible tier 2 premium tank destroyer. Bíró Ádám: A páncélosfegyvernem megteremtésének kezdetei a Magyar Királyi Honvédségben II. rész. In: Haditechnika 1993/3. 61-65. Varga A. József (szerk. ): Magyar autógyárak katonai járművei. Bp., 2008. 224-234. Bonhardt Attila: A 35. M. Ansaldo, a magyar honvédség első rendszeresített harckocsija. In: Haditechnika 1985/2 32-34. Horváth János: Gebauer Ferenc fegyverkonstruktőr. In: Haditechnika 1987/1. 33-35. Pap Péter: Adattár Gebauer Ferenc fegyverkonstruktőr pályafutásához és az általa tervezett lőfegyverek kategorizálása. In: Hadtörténelmi közlemények 2012/3. 701. Yep, the gun of the Pz. I C could fire armour piercing ammunition, while the Hungarian 8mm Gebauer had only infantry rounds as ammo. We all know already, that this is not a problem for WG. I’ve always liked that vehicle but the Hungarian 8mm MG is too weak. Italy at least had some small caliber AP rounds even for MG’s but to function at tier 1 I think it would really need the 20mm or 37mm short cannon options. BTW: Good read, thank you for it.